Often misunderstood, federated and affiliated colleges offer distinct missions and a small-campus feel, plus the benefits of their larger partner universities. It was a unique food and nutrition program that lured Caitie Cheeseman to Brescia University College in London, Ont. What sealed the deal was the moment when the admissions officer who had come to her high school on a recruiting visit quickly recognized her by name when Ms. Cheeseman showed up for a campus tour. That person, Wendy Latimer, made a point of staying in touch with Ms. Cheeseman to guide her through the application process and eventual course registration. Ms. Cheeseman is one of 1,350 students at Canada’s only all-women’s university and is a testament to its commitment to developing young women’s leadership skills along with their intellectual pursuits. Most of her courses must be taken at Brescia, but she is also within easy reach of the courses, services and activities at the main campus of Western University, a six-minute walk away and with about 20 times the enrolment. Brescia, founded by a group of Ursuline nuns with its first class of seven students in 1919, has been affiliated with Western since the beginning. 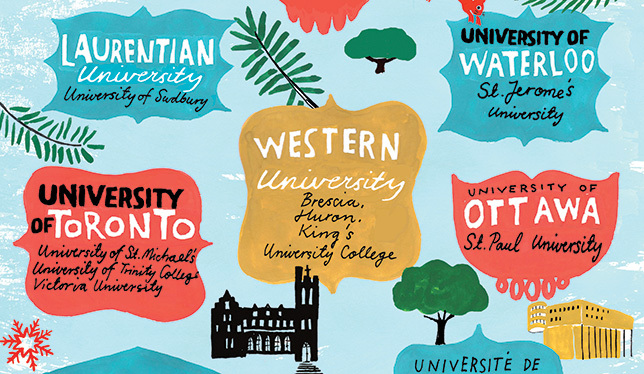 Two other colleges, Huron and King’s, are also Western affiliates. Brescia’s story is fairly typical of affiliated and federated colleges, and its history speaks to that of the country itself. Higher education in the 19th century was frequently an initiative of religious groups seeking a place to train the next generation of clergy in communities big and small. Eventually, to build credibility and sustain themselves financially, these denominational institutions either banded together or joined with secular, publicly funded universities. This desire for credibility and the ability to offer recognized degrees led to many creative arrangements, surmounting geographic distances as well as linguistic and religious differences. The University of Manitoba was founded as a non-denominational university in 1877 from three colleges: the francophone and Catholic Collège de Saint-Boniface; the Anglican St. John’s College; and the Presby-terian Manitoba College. Campion College, founded by Jesuits in Regina in 1917, first affiliated with U of Manitoba, then in 1923 was recognized as a junior college of the University of Saskatchewan. In 1964, it was granted federation with the Regina Campus of U of S, which later became the University of Regina. The fledgling Victoria College in Victoria, B.C., meanwhile, was affiliated with Montreal’s McGill University between 1903 and 1915, becoming the independent University of Victoria much later. Affiliated and federated colleges are in many ways “artifacts of history,” writes former Ontario senior public servant David Trick in a 2015 report on the subject for the Higher Education Quality Council of Ontario. Affiliation and federation arrangements are often taken for granted or misunderstood in the fabric of everyday campus life. Yet their typically smaller classes, unique programs, distinct missions and priority given to teaching make them “highly relevant,” he says, to the goal of providing high-quality undergraduate education in an era of near-universal access. When considering the history of affiliated and federated institutions, “I’m in awe,” says Kenneth-Roy Bonin. “We don’t realize where we’ve come from. There are a lot of lessons to be learned.” Dr. Bonin, a senior fellow in the faculty of public affairs at Carleton University and a former president of the University of Sudbury, has made it his mission to collect and catalogue as many of the country’s affiliation and federation agreements as possible, working in conjunction with Glen Jones, a professor of higher education at the Ontario Institute for Studies in Education of the University of Toronto, and Pat Moore, a systems librarian at Carleton, along with a group of graduate students. At last count, the team had amassed more than 250 such documents, 25 still current. The agreements are archived on a digital objects database maintained by Carleton. By far the largest concentration of affiliates was found in the Catholic collèges classiques system, the dominant form of upper secondary and early postsecondary education in Quebec and in francophone communities outside Quebec during the 19th and early 20th centuries. Dozens of these schools affiliated either with Université Laval starting around the 1860s or later, or with Université de Montréal, which itself was initially a branch of Laval. The affiliations fell away in the secularizing times of the 1960s and ’70s, when many colleges were subsumed into Quebec’s junior-college CEGEP system. The remaining vestiges of affiliation in Quebec are École Polytechnique and HEC Montréal, which share a campus and a certain number of resources with Université de Montréal. “Affiliated” and “federated” are easily confused terms, even by those who wear them – and the definitions can be a bit fluid. In Ontario, for example, Mr. Trick says that whether an institution is affiliated or federated, “the practical consequences are the same.” In an affiliation, the institution may suspend some or all of the degree-granting powers it has so that graduates can receive credentials from another university, sometimes called the “parent” for lack of a better word (affiliated institutions generally disapprove of the term). Many schools with theological or divinity studies continue to confer those degrees independently and do not suspend the privilege. The affiliating institution’s degree programs may otherwise be subject to the approval of the parent institution’s senate, even though the affiliate still maintains its own governing board. A federation, generally speaking, is a specific type of affiliation where two or more institutions come together to create a new university that is recognized by civic authorities and is eligible for government funding. That was the case when the existing University of Sudbury (previously the Jesuit Collège du Sacré-Coeur) came together with the new Huntington University (United Church) and Thorneloe University (Anglican) to form the Laurentian Federation in 1960-61. How those responsibilities have been divided, powers retained, enhanced or given up, what happens to funding and what students have access to as a result, have been as varied as there are agreements. When it comes to the actual written agreements – some simple two-pagers, others going on much longer – “there are no two of them the same,” says Dr. Bonin. “They’re complex, important relationships and also evolving,” confirms Mayo Moran, provost of the University of Trinity College, which has been federated with the University of Toronto since 1904 and is home base to 1,800 students out of a total of 52,000 on U of T’s downtown St. George campus. As a U of T “fed head,” Dr. Moran reports to her college’s own board; employees have their own labour agreement and a separate pension plan, and the college has its own endowment fund and owns the land its Gothic Revival building sits on. Like U of T’s two other federated institutions – St. Michael’s and Victoria – a governing framework agreement is reviewed and revised by the college and U of T every decade, with an operational agreement reviewed every five years. “Trin” students take courses from across the wider St. George campus, yet also enjoy unique traditions that reach back to the school’s Anglican roots – even if recent students are more attracted to the college’s resemblance to Harry Potter’s Hogwarts school. These traditions include wearing academic gowns to formal occasions such as regular Oxbridge-like “High Table” dinners that are preceded by a Latin grace and served after evensong. At Christmas, the silverware of 19th-century Trinity founder Bishop John Strachan is pulled out and the fireplace gets lit for a traditional meal served in the wood-panelled hall named in his honour. Elements like these help students to feel “like you’re part of a very distinct entity within the large and wonderful university,” says Dr. Moran. There is no such option – and no worry about getting lost in the crowd – at the francophone Université de Hearst in Northeastern Ontario. At 140 students, it is among Canada’s smallest affiliates, operating campuses in Hearst, Kapuskasing and Timmins. First affiliated with the University of Sudbury and later Laurentian University, the mother ship’s campus is up to a seven-hour drive away, making it easy for Hearst to have an independent feel. As well, Hearst receives its funding directly from Ontario’s government and has its own strategic mandate agreement, which is not typical for an Ontario affiliate. Affiliation cheerleaders often point out that affiliates are in a better position to innovate than their larger partner institutions because of their size. At the same time, innovation may be key to their survival. That’s true of Hearst, which last year introduced a different approach to course delivery in a bid to increase enrolment. Instead of taking multiple courses at once, Hearst students take one course intensively over three weeks before moving on to the next (a system in place also at Quest University in Squamish, B.C.). Since starting the block scheduling system in 2014, the school has seen a 40 percent increase in enrolment, including going from next to no students from outside the region to 30 percent now. Calling it “a game changer” which has resulted in “deeper learning” for students, Hearst’s rector, Pierre Ouellette, says such a move would be hard for a larger university to pull off, even though Hearst still required Laurentian’s approval once it had gotten everything through its own senate, board of governors and faculty union. “Smaller units come to consensus quicker than larger or even medium-sized universities,” he says. The newest kid on the affiliation block is Ottawa’s Dominican Univer-sity College, a bilingual Catholic institution of 110 students. It affili-ated with Carleton University in 2012 after many years of trying to find an appropriate and willing partner. Dominican was established by the Dominican’s Order of Preachers in 1900, and specializes in theology and the continental approach to philosophy. It was during discussions on affiliation that Dr. Bonin – at that time on Dominican’s board – realized there were few templates available that could serve as models for the simple agreement both parties wanted. Under the arrangement, Dominican secured 30 funded places for graduate students while Carleton received 100 additional graduate spots spread out over five years. Before that, Dominican received only limited grants for non-academic spending, making it an anomaly as an independent, denominational and degree-granting institution in Ontario receiving any public funding at all. Bringing an extra $500,000-plus to what is now a $2.5 million budget, affiliation has allowed Dominican to offer its faculty better salaries, provide more financial assistance to students and gives graduate students more clout when applying for research grants. “It has secured a future,” says Dominican President Maxime Allard. Without the affiliation and all that it has brought, he says, the college may have survived only another 10 years at most. Dominican students are entered into Carleton’s student enrolment system, have access to its library and – apart from those pursuing professional, ecclesiastical studies – receive their diplomas jointly from both institutions. Carleton students can take electives at Dominican. A general principle of the agreement is to leave the door open to further discussion and cooperation as opportunities and interest arise. Already, the two institutions have come together for a conference celebrating the birth and work of philosopher Jean-Jacques Rousseau and the presidents of both institutions have taught one another’s lectures. Affiliates can sometimes chafe at their status, struggling to assert and broadcast their independence, unique identities and offerings while constantly working to be better understood by their counterparts at the larger institution. They can have difficulty attracting faculty and donors, as well as accessing public money for capital projects. When it comes to representations to government, they often have no direct seat at the table. Dr. Trick, author of the recent HEQCO report, comments that affiliates “are invisible” in government data collection about Ontario universities. There have been failures, too. Carleton entered into its affiliation with Dominican despite a prior unsuccessful affiliation with St. Patrick’s College that ran from 1967 to 1979, when Carleton closed the college due to poor enrolment and financial problems. Canada’s Maritime provinces twice saw unsuccessful efforts to merge a collection of denominational and non-denominational universities into a single secular one: the five-year University of Halifax experiment involving six institutions, between 1876 and 1881, and a subsequent attempt by Catholic clergyman Jimmy Tompkins in 1921 and 1922 to create a single University of the Maritimes. Both fell apart due to religious differences. Very good piece. I looked at the same subject many years ago from a qualitative point of view but your piece is just very insightful. Former registrar of Université du Québec system. A reflection on the unique contribution that federated and affiliated institutions bring in the postsecondary landscape is very welcome. I would like to add that while many affiliated and federated were created by adding to or putting together of already existing resources, Saint Paul University’s federation with the University of Ottawa resulted from a division of efforts. Saint Paul University continued some of the activities that were part of the “old” University of Ottawa. Moreover, Saint Paul University and the University of Ottawa is the only federation with a renewable MOU. Thank you for the timely (for me) review of federated and affiliated colleges. As a member of the board at St Paul’s, U of Waterloo, I welcome the wider view that history and shared experience provide. Please correct the spelling of Thorneloe University in your article – it is “Thorneloe” not “Thornloe.” Thank you.